Texas A&M quarterback Johnny Manziel thinks he's ready for the pros -- if that's what he decides to do. The 2014 NFL Draft is supposed to have a quarterback class for the ages. It’s widely assumed that Johnny Manziel will be a part of that class, but he hasn’t declared his intentions just yet. That didn’t stop the 2012 Heisman winner from addressing his future, albeit unofficially, when asked if he thought he was ready for the NFL. 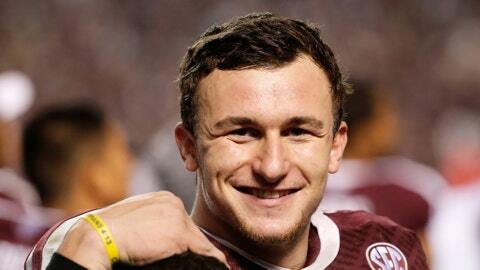 "In my mind, I think I am," Manziel told Fort Worth Star-Telegram. "I feel like I’m playing, for the most part, at a really high level of football." With so many quarterbacks thought to be in this upcoming draft, Manziel may want to wait a year and get drafted higher in the 2015 draft. That said, Manziel also has his Texas A&M legacy to consider. "If this was to be the end of it, I want to be one of the best to ever play at A&M," Manziel said. "Hopefully, I did my part to try and help build the program and take it to another level." Manziel expressed that he not only evaluating his skill set but also the market before he takes the next big step in his career. "You don’t want to go and be unprepared for the National Football League and leave two years on the table," Manziel told the paper. "It all comes down to making the best decision for you. Whether you’re ready. Whether teams are quarterback-needy. You look at all your factors." Well, that likely settles nothing until Manziel is officially forced to make up his mind by the underclassman deadline of Jan. 15. In the meantime, Manziel will be at the Heisman Trophy presentation on Saturday hoping to hold off Florida state quarterback Jameis Winston and win it for a second straight year. Can Johnny Football pull it off? Charles Davis handicaps the six finalists below.